Rem Koolhaas says the west is missing out on crucial conversations about architecture and urbanism because of a prejudice towards projects in authoritarian countries. 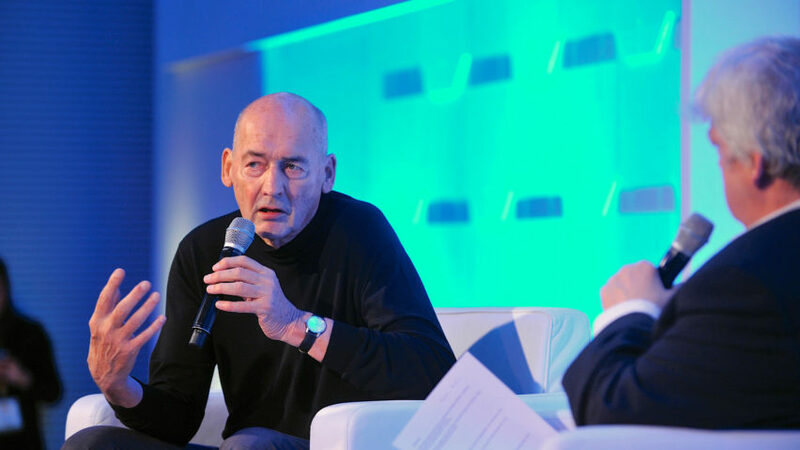 Dutch architect Koolhaas, who said he "believes deeply in democracy", has warned that an automatically negative approach to work completed in China, Russia and the Arabic-speaking world is counter-productive. "In China, there's a very authoritarian regime that is doing wonderful things in many ways for its citizens," said the OMA founder in a keynote speech at the World Architecture Festival on Friday. "What preoccupies me is the only thing we can do is judge, and judge those developments entirely as negative," he stated. "We are unable to be both critical and have sympathy." "There is too much moralism going on"
The architect, who is also a professor in architecture and urban design at Harvard University, called for western architects to adopt a more nuanced approach when looking at developments in countries with dictatorships. "We are not active enough in undoing the sense of innate superiority that we have seen as our birthright," he added. "Dialogue is clearly crucial. There is too much moralism going on that sabotages that." OMA has completed projects in all of the places Koolhaas mentions. Among them are the Garage Museum in Moscow, the CCTV Headquarters in Beijing and the Qatar National Library in Doha. The architect says the CCTV Headquarters is a good example of how architecture can benefit from broader international engagement. The twisted skyscraper, which forms a technically impressive loop, was only achievable because the design process mandated over six meetings with 150 of China's top engineers, said Koolhaas. Architecture can "intervene to defend values"
The building proved controversial – OMA sustained criticism both from the west for working with the Chinese government, and then from within China when president Xi Jinping called for an end to "weird architecture". But the collaborative effort created a shift in the conversation, said Koolhaas. "One of the effects of CCTV is that China you can now do more experimental structural things," said Koolhaas. "[Architects] can intervene in a way that modifies maybe slightly or defends certain values," he added. "Once we have a crisis, we have an alibi not to deal with it"
Western democracy itself is under threat from within, said the architect, due to a pervasive lack of "imagination" to engage with current issues or think critically about them. "If you now listen to American businessmen in Silicon Valley, that conviction that democracy may be a form of inconvenience and that other regimes are more pertinent seems to be widespread," he said. "I feel that a society like ours is unbelievably passive in indulging that kind of reading." Koolhaas takes particular issue with the destructive language favoured by tech companies. For instance Facebook, which has come under the spotlight for the potential impact its platform may have had on elections in the US and UK, used to operate under the motto "move fast and break things". "I’ve been for a long time also very surprised that the word disruptive, disruption, has such a magical appeal, because I find it in the context a rather off-putting word," he said. He claimed that, while business leaders undermine democracy, there is a growing complacency on issues such as identity, immigration and the refugee crisis. Even the word crisis has become problematic, he said. "We call everything a crisis and, once we have a crisis, we have an alibi not to deal with it," said Koolhaas. "It’s deeply depressing or sad that there is not more energy emanating from... the classes in the countries that are in as frankly privileged a position as we are," he added. The Netherlands is now "absolutely hostile"
He bemoaned that the Netherlands, a country that was once "totally open" has in just three years become an "absolutely hostile environment". "It seems like the last energy we are ready to spend is to retain our own privileges." The keynote speech took place on the final day of the World Architecture Festival 2018, held in Amsterdam from 28 to 30 November. Other speakers included David Adjaye, who spoke out against the corrupting force of money in architecture and urged architects to "push justice into the equation" when designing for cities. Main image courtesy of WAF.